Reduce your 8(a) Application review time, at the SBA, by 30+ days. There are several certifications that are required to be submitted within your 8(a) Application paperwork. Failure to submit these signed and dated certifications will result in a letter back from the SBA deeming your 8(a) Application deficient or incomplete. Please note. None of the below certifications are identified within the SBA’s current 8(a) Checklist. This blog post alone will save you at least one letter back from the SBA and possibly 30+ days of processing time at the SBA. Certification that the applicant firm’s financial statements truthfully and accurately represent the financial condition of my company. Certification that no 8(a) applicant, owner, director, or key officer of the applicant firm, or the applicant firm itself, have any delinquent federal obligations, past due taxes or liens. Certification that no immediate family member of any 8(a) applicant, owner, director, or key officer of the applicant firm has ever been an officer, director or shareholder of any other firm that is a current 8(a) Program participant or was a previous participant in the 8(a) Program. Certification that no 8(a) applicant, owner, director, or key officer of the applicant firm has ever been an officer, director or shareholder of any other firm that is a current 8(a) Program participant or was a previous participant in the 8(a) Program. Certification that the no 8(a) applicant, owner, director, or key officer of the applicant firm has any ownership interest in any other business other than the applicant firm, or has an immediate family member who has ownership interest in any other business. You should put each of the above certifications on a separate printed sheet and sign/date all of these and include a copy within your 8(a) Application. Please make sure all of these certifications provided to the SBA are accurate and truthful. Penalties for misrepresenting anything in your 8(a) Application are severe. If any of the above cannot be provided because they might apply in your circumstances, please call us at 813-333-5800 for more information. There are 7,078 active SBA 8(a) Certified firms as of July 1, 2014. 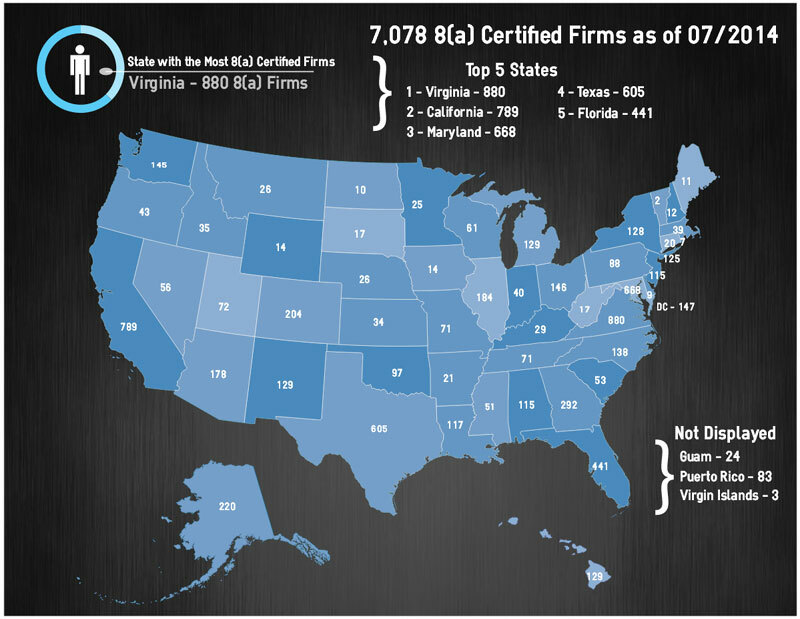 Below is an info graphic showing the location by state and number of active SBA 8(a) Certified firms. The source of this information is the SBA Dynamic Small Business database. This information is provided by Cloveer.com. Cloveer provides products and services on the SBA 8(a), HUBZone and VA VetBiz programs. Have additional Questions? or want to get started on your SBA 8(a) Application? With 14 years and over 2,000 successful applications under our belt, we can assure you that no matter which option you choose, Cloveer will work harder and faster to get your business SBA 8a certified. Contact us today at 813-333-5800 or visiting our website at www.cloveer.com to discover what Cloveer can do for you. We also offer these options for further assistance in completing your 8(a) Application. For those who wish to complete the application on their own we offer an 8(a) Application Review service. Here, one of our 8a program experts will review your entire application, checking it for missing documents and potential eligibility issues. We will then advise you as to how best to modify your application to ensure it will be approved an SBA reviewer. The majority of our clients however, prefer a little more of a hands-on approach. They recognize the expertise we have accumulated in the over 14 years we’ve been assisting clients obtain 8(a) certification, and want us to put it to use for them. If you opt for our 8(a) Application Completion Service, we will work one-on-one with you to ensure that your 8(a) Application is 100% complete and compliant so the SBA can review and accept it the first time. Do you qualify for the SBA 8(a) Program? There are many eligibility criteria that a small business must meet to qualify for the SBA 8(a) Program. We have developed a free online 8(a) eligibility questionnaire that anyone can use to see if their business meets the 8(a) eligibility criteria. This free online 8(a) Certification Eligibility Questionnaire should generally be completed by the individual who primary 8(a) Program Eligibility will be based upon. The questionnaire will take approximately 10-15 minutes to complete and as you answer most of the questions, it will automatically inform you if you have a potential eligibility issue. With 14 years and over 2,000 successful applications under our belt, we can assure you that no matter which option you choose, Cloveer will work harder and faster to get your business SBA 8a certified. Contact us today to discover what Cloveer can do for you. Among the many 8a business development program eligibility requirements, the applicant for 8a Certification must have a personal adjusted net worth of less than $250,000 at the time of 8a Application Submission. 8a certification is a valuable marketing vehicle for socially and economically disadvantaged small businesses to access the federal government marketplace. Initially, contracting under the 8a Program may seem more difficult than other methods. However, it is no more complicated than contracting under full and open competition through the sealed bid procurement process and it presents many advantages for both the government and the 8a contractor. A big advantage for government procurement personnel in selecting the 8a contracting method is that the agency does not have to solicit bids and may choose a specific 8a contractor to fulfill its requirements. For sole-source requirements under the competitive thresholds, the contracting agency can identify the 8a company to perform a contract by simply naming that company in an offering letter to the SBA. Of course this does not happen by itself. The 8a firm must actively self-market with the contracting agency or be introduced to the contractor through a referral. For competitive 8a requirements, the contracting agency does not have the same ability to choose a contractor, although the competition can be limited to eligible 8a companies within a certain geographic area or participation stage. Another advantage for the government is that they can often get what they need faster by contracting though the 8a Program. This is because competitive requirements must be synopsized in FedBizOpps and the resulting solicitation must be open on the street for a minimum of 30 days. This process for full and open competition can take several months. 8a contracts have no synopsis requirements (except for competitive 8a contracts) and contracting agencies are not required to allow 8a firms 30 days to respond to the solicitation. Therefore 8a contracts can be finalized much faster. The advantages to an 8a company are great. An 8a company can obtain federal contracts on a sole-source or limited competition basis much faster than in a full and open competition. For many small businesses, the costs of preparing proposals are very prohibitive. If the contract is a sole source, the 8a firm does not have to endure the costs associated with preparing a competitive proposal and participating in subsequent rounds of discussions with the contracting agency’s contracting officer. Once the buying agencies are aware of the advantages of the 8a process and have a good experience with your 8a firm, they will most likely prefer to extend future contracts to you. The SBA plays a role in the beginning of the contracting process by verifying and approving the requirement for the 8a company. Once the requirement is in place, the 8a company and the federal agency deal directly with each other during negotiation of the contract and during performance of the contract. Looking for help with Getting 8a Certified? For clients who are too busy running their businesses to complete the application themselves, we understand you don’t have time to look over the 8a checklist and that you would rather have a group of trusted 8a program experts more involved in your application. Cloveer offers other services including an 8a Application Review, and for those who would like their entire 8a application completed and approved in record time, a full 8a Application Completion Service. No matter which option you choose, Cloveer guarantees that no other company will work harder or faster to assist you in getting your business SBA 8a certified. We have been assisting clients to obtain their 8a certification and maintain their 8a program eligibility for over 10 years. As such, we know the SBA 8a program regulatory requirements, 8a standard operating procedures and Office of Hearings and Appeal cases that affect the 8a program better than 99.9% of anyone else out there. At Cloveer, we believe in treating you the way we want to be treated. We go the extra mile to make sure your experience with our company is outstanding. Contact us today to discover what Cloveer can do for you. Keep in mind that each 8(a) Application is unique and document requirements vary based upon the entity type and number of applicants.